Things we did today...: Second Sewing Success! Even with yesterday's success to our credit... I was hardly able to sleep last night. My mind was spinning with all of the possible ways I could do this project, and all of the possible ways it could go wrong. Our boom has rubbed an awful gash in the top of our bimini. When we bought the boat there was a lovely piece of silver duct tape "protecting" (read hiding) the wound. This is one of the primary reasons we bought our new Sailrite machine. This and all future canvas issues will be swiftly dealt with as we now have the POWER! OK, now back to reality... 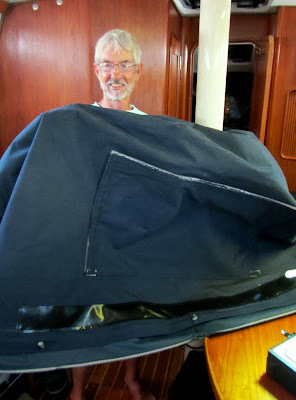 I was nervous about how much "pull" would be applied to my repair and whether or not I would be able to wrangle this giant piece of very stiff bimini into the machine so that I could even BEGIN to sew it. I took the new hot knife for it's inaugural spin (Wheeeeee!) by cutting the patch fabric into 1 1/2 inch strips the length of my repair. We chose to sew the patch on the back part of the bimini first, as it wasn't worn as badly as the front, which took the majority of the abuse from the boom. In other words, we started with the easier part. It went very well and we were encouraged. Easy to cut with scissors, no hot knife needed. Once we finished admiring our handiwork, we discussed our game plan. We would be limited in the distance we could overlap our patch fore and aft by the way the bimini was put together. We could go towards the center of the bimini a bit more, but didn't want the rub patch to be too conspicuous. We decided to cut a three inch strip, 48 inches long, of the black Shelter Rite material we had chosen for the job. Once again, the basting tape we got from Matt at Coastal Bend Yacht Services saved us. I cut and placed strips ladder style along the black material. I stuck them to the topside of the bimini and we were ready to sew. Sewing the black material went much better than I had imagined. It didn't pucker or try to escape. I won't say that my stitches are totally straight, but they are within acceptable limits. We used the three different "foot positions" to get the stitch close to the edges. But we still had to deal with the "gash"... And it wasn't pretty. The split in the material was all crusty and crumbly. How would I bring the edges together long enough to allow for sewing? Bring on the trusty basting tape once again! I cut small strips and used them to tape the split closed "Frankenstein Style". I stitched along the split with a wide zig-zag stitch right over the basting strips. Then we took the paper off of the basting strips and stuck down the patch material to hold it in place for sewing. It went on without a hitch continuing with the zig-zag. This time, we sewed another line down the middle to hold the patch material to the split underneath. The last step was sewing the vinyl rub patch over the top of the bimini just like we had done on the aft end and that's IT! We're done! We put the bimini and enclosure panels back onto the frame and once we got it all centered and adjusted right, it looked marvelous. It doesn't look quite like it would if we had paid a professional to do it. I'm not sure what they would have done differently, but with the tools we have available and for the cost differential, we're totally happy with the outcome of this project... and inspired on towards the next one! Great step by step post! I'm glad it makes sense to someone other than me! Thanks for your comment!